Patients who are receiving Social Security disability for sarcoidosis know that this immune disorder can occur in a variety of locations throughout the body. Tiny clumps of immune cells called granulomas can grow inside the lungs, heart, and under the skin, affecting proper organ function, and causing permanent tissue scarring. 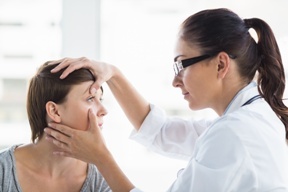 Unfortunately, many patients who suffer from sarcoidosis experience symptoms affecting the eyes, including persistent burning, redness, dryness, and itching. Some patients may even have difficulty seeing, have painful light sensitivity, and experience blurred vision or partial blindness. Vision loss. Ocular sarcoidosis can cause a variety of vision disturbances, including partial or total blindness. A person can collect disability based on total blindness regardless of the underlying condition, and will likely qualify if visual acuity and the range of visual fields have been significantly affected. Work restrictions. A person who still retains some ability to see can be approved for benefits based on his or her residual functional capacity (RFC). This is because a person who has impaired vision will likely have limitations that affect the ability to earn a living, such as an inability to drive. Sarcoidosis also has dormant and active periods, meaning patients could only work intermittently and will often need long periods of time off. In order to get disability, claimants must be able to prove that they will not be able to work for at least 12 months as a result of their condition. Medical records. The SSA will need a confirmed diagnosis of sarcoidosis from a medical professional, as well as a medical report of your specific symptoms and a likely prognosis for the future. The diagnosis is especially important, as the symptoms of sarcoidosis can vary greatly from patient to patient, and many other conditions have similar symptoms. In many cases, patients will suffer from sarcoidosis for years before a definitive diagnosis is made. Patients will often need a variety of diagnostic tests, such as imaging scans and blood tests, in order to detect the growth of granulomas that characterize sarcoidosis. Full symptoms. Patients in the early stages of sarcoidosis may not be able to collect benefits based on their vision symptoms alone. However, sarcoidosis is a systemic problem that can cause adverse symptoms throughout the body. Patients will often suffer headaches, extreme fatigue, chronic pain, and other symptoms depending on the stage, location, and treatment of the condition. If the combination of symptoms a person experiences is disabling to the point that he or she cannot reasonably earn a living, the patient may be awarded benefits under medical-vocational allowance. Permanent disability. Many sarcoidosis sufferers will be unable to work at all in the latter stages of the disease. In these cases, claimants should be careful to demonstrate the symptoms of the condition that are causing disability, especially if these symptoms qualify for payments under another impairment listing. The important thing to remember about applying for benefits is that claimants could qualify even if their condition does not meet the exact requirements of an SSA disability listing. Approval for disability can be based on the severity of symptoms alone, as long as those symptoms are similar to those of another listed impairment. Your doctor will be vital in determining your RFC rating, which will depend on your ability to perform your old job, learn a new job, concentrate, and complete work on time without assistance. If you think you may qualify for disability benefits, please feel free to contact our law firm today to get started on your application or download our free report, Five Most Frequently Asked Questions about Social Security Disability.